I've been having trouble getting pictures to post to my blog but I hope the problem is resolved because today I'm bringing you something COMPLETELY different than my normal posts. For those of you who don't know - my father owns a bar called The Barn. It truly is an old barn that was converted into a small town, happy little bar. He got a wild hair and talked a lot of our patrons into doing a Murder Mystery game last night. He also asked me to attend to take pictures and help out here and there. I have to say, everyone who came really went all out with their costumes! Also, they played their characters as if they were really those people. We live about 37 miles from the famous town of Deadwood (if you follow the interstate and highway) However, as the crow flies, I'd GUESS we are only about fifteen miles from Deadwood. It seemed fitting that the mystery my dad chose would be Murder at the Deadwood Saloon. I have antiqued these pictures to give it more of an authentic feel. I want to thank everyone who came to the party and hope everyone had as much fun as I did! I apologize for letting some of my posts run several days this week. Actually, when I do this, it's usually a good sign. I've either been writing other things or getting caught up in other book related activities. However, this time it has been because my whole family came down with something. Three kids, all running fevers is NOT fun, especially when you don't feel good either. My sweet brothers came to my rescue yesterday and fed us pulled pork sandwiches for dinner. What a sad life I'd live if I didn't have my brothers and Dad! Now, I'm going to try to write a quick Recently Read post for Mockingjay , the last book in the Hunger Games series. Please bear with me as my mind is still semi-muddled from the cold medicine, not to mention the constant muddling I deal with daily. I've read all kinds of good comments about this series over the past months but the description for The Hunger Games had me thinking "meh." I've even had this exact conversation with a Facebook friend recently. However, since it was receiving good reviews and my daughter and I had Amazon gift card money to play with, I thought I'd buy the first one for her. I truly had no intentions of reading the series. However, I'd finished a book and was confronted with my huge TBR list on my Kindle. My thought, when I clicked on The Hunger Games was, I suppose I should know what I'm going to allow my ten-year-old to read. So, I opened it with intentions of quickly scanning it. I will admit the tense these books are written in really threw me off for the first few pages, but the STORY was so good I barely noticed why and when I was stopping to re-read something. By the time I bought and opened up Catching Fire I'd become accustomed to reading in a different tense than I am used to. I have nothing but good to say about this series. I finished the full series in about a week because the books were so compelling and I had a hard time putting them down. I did wait a short amount of time between The Hunger Games and Catching Fire but immediately went to Mockingjay as soon as I finished the second one. Suzanne Collins did a wonderful job with ending the first two books as if it were just the beginning of the story. And, actually, they were. However, I was pleased with the ending of Mockingjay and felt it was a good conclusion. I was sad to have the adventure come to an end but at least I wasn't left wondering how things turned out. These books are some that I will recommend to anyone who enjoys to read. If Ms. Collins were to write a follow up to this series with new characters, I'd jump to buy the first book! Sibel Hodge has dual British/Turkish Cypriot nationality and divides her time between Hertfordshire and North Cyprus. Her first romantic-comedy novel, Fourteen Days Later, was shortlisted for the Harry Bowling Prize 2008 and received a Highly Commended by the Yeovil Literary Prize 2009. Her second novel, The Fashion Police, is a hilarious comedy-mystery novel, the first in the series featuring feisty, larger-than-life, Amber Fox. It was runner-up in the Chapter One Promotions Novel Competition 2010. My Perfect Wedding is her third novel and is the sequel to Fourteen Days Later. 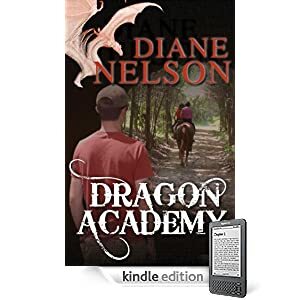 To kick it off for Diane Nelson and her book, Dragon Academy I am going to do a simple feature of said book. With high school finished for the summer, Nick looks forward to visiting his aunt and uncle in New Jersey. What awaits him is a heat wave like no other - and the last two Greywings on the planet. Nick has an innate ability to train horses but will he be able to translate his amazing skill to these teenage dragons? The steaming soup of mid-summer heats up tempers and tests resolve as Nick vies with fellow trainers, Keith and Maxie, for mastery over their new charges. The dragons, Nikita and Michael, typical teenagers themselves, have other ideas. Nick treads a torturous path through a minefield of competing demands: the expectations of his aunt and uncle, recalcitrant horses, the Academy’s female students and the overwhelming egos of Nikita and Michael. One small mistake erupts into a conflagration that hurls everyone into a race against time and forces of nature. Mr. Hamric is giving away ANOTHER Kindle WiFi on January 31st! I believe this makes three. Actually, he's giving away a $139 Amazon gift card so you can buy your own Kindle from Amazon. 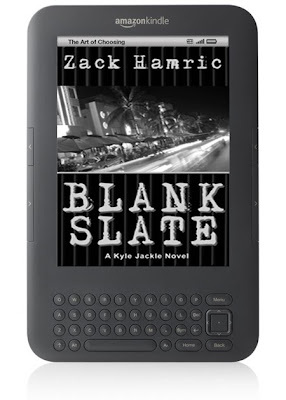 All you need to do is share his giveaway on Facebook (worth 1 entry), buy a copy of Blank Slate (worth 5 entries), buy a copy of Crescent Rising (worth 5 entries), or leave a review for one of his books (worth 5 entries per review), then send him an email at: ZacharyHamric@hotmail.com to let him know of your entries. Ami Blackwelder is offering up a .pdf copy of The Shifters of 2040 to two lucky winners. All you need to do to enter this one is click the link above or below and enter your email address in the comment section. Good luck! Blog Tour - Day Six! Blog Tour - Day Four! Blog Tour - Day Three! Blog Tour - Day Two!